Fantastic day filled with many talented young players playing ultimate Frisbee. 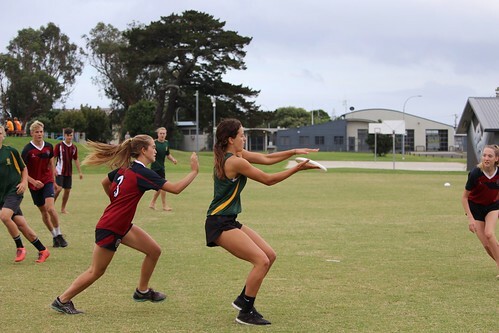 It was Whakatane High School and Mount College's first time taking part this year. Defending champions Te Puke High School mixed team won the open grade against Katikati college young guns. What a final the quickness and passing skills of the dynamic Katikati young guns and the athletic talented Te puke high School students was exciting to watch. It was the closest game of day. Point for point the last dying 3 minutes Te Puke scored an amazing point. Then a minute later they scored again leading by two. Katikati could not recover but never gave up but Te Puke held there nerve to take the trophy. Mixed grade was between Katikati mixed and Mount College. The dynamics and skill from both teams was a sight to see. Mount College were triumph to take out the mix trophy 2019. Thank you to Mount Ultimate Frisbee Mike Chi Chi and Stacey and Vaughn for running the event without you guys the event would not have happened. Join us for a weekend of awesome fun, flying frisbees, and faces full of sand. You can even try surfing or tackling Mauao (the Mount) to stretch your legs between games and there will be an epic party for players on Saturday night!